Combat Fire do a free site survey. We design and install your fire protection system. We carry out routine, but essential, maintenance on all of the fire protection equipment. But – what happens when a fire is detected? You need staff that are trained in how to react to a fire and use the correct extinguisher. You need a competent person who can marshal all of the resources available and take charge if a fire breaks out. 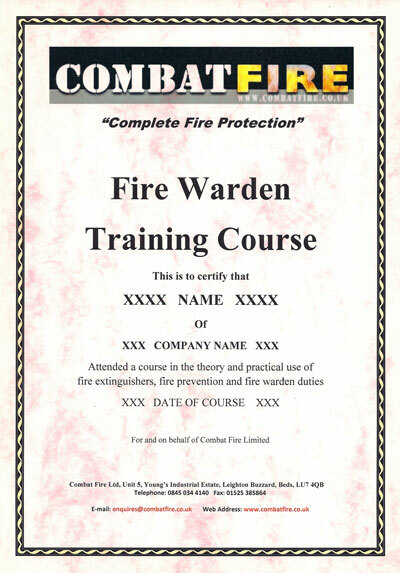 Combat Fire can come to your premises, at a time that suits you, and train all staff in fire extinguisher use (typically a 90-minute session and we can hold four in a typical day) so that you can be sure that staff will know how to use the correct equipment in a fire situation. Click here for full details. Fire Warden training (as well as deputy wardens) can be trained, again at your premises, in a course lasting half a day. These people are your first line of defence and it is essential that they are fully aware of the risks in the workplace. Click here for full details. When you successfully complete any of our fire training courses, all candidates will be awarded a Fire Training Certificate to prove to the Fire Officer that training has been carried out and that staff are capable of acting in a responsible manner when a fire is detected.